Who Else Wants an Extraordinary Ranch Near Park City, Utah? If you’re looking for a trophy Park City, Utah property you could buy the Huntsman family’s 60+ acre estate in Deer Valley for $29.5M. Or, you could be a smart value investor--think Warren Buffett or John Jacob Astor--and buy further East, acquiring an even larger property at a much lower price. Way back then, Astor became one of America’s wealthiest men by purchasing property just ahead of New York City’s inevitable expansion. Then he waited for New York’s predictable growth to come to him and push the value of his properties sharply higher. Such a simple process...and it worked like a charm! Growth is undeniably moving in Utah’s direction. Utah’s economy has helped lead the nation out of the downturn, boasting the third lowest unemployment rate (3.4%) in the nation in January 2015, according to the U.S Dept of Labor, Bureau of Labor Statistics. Even better, Utah’s infrastructure is in place to support the wave of growth that’s coming. Over $600 million was invested into infrastructure improvements prior to the 2002 Winter Olympic Games, according to the Governor’s Office. The Salt Lake International airport, only about a half-hour from Park City, Utah, features more than 700 daily scheduled flights, with non-stop service to 90 cities around the world. Vail Resorts $185M acquisition of Park City Mountain Resort in Sept 2014, combined with their $25M annual lease to operate Canyons Resort, has laid the foundation for Vail to create the largest ski area in the USA. Vail Resorts has committed to invest another $50M in cash in 2015 to merge the two resorts with a new gondola, not to mention new restaurants and additional on-mountain amenities. Utah resorts set a new record for skier days in winter 2014/15, due in part to Vail’s attractive “Epic Pass” program that enables Vail’s season-pass holders from their other portfolio of resorts to ski for free at Park City & Canyons Resorts. Along with this booming success comes crowds, increased demand for properties, higher prices, and more traffic. So where will you be able to find the laid-back feel that you remember about Park City 20 years ago? Remember Astor’s “invest in the path of inevitable growth” strategy? You now have a similar opportunity with ranch property just outside of Park City, Utah. While slope-side properties in Deer Valley, Park City, and Vail’s Canyons Resort and are already fully priced, comparable estate properties are still a much better value just to the east in rural Summit County, UT. There’s an exodus afoot—families are yearning to escape the crowds and busy feeling of the Park City & Deer Valley Resort areas and are looking for a more discrete and unpretentious atmosphere. 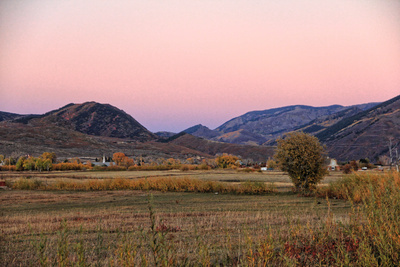 The stunningly beautiful Kamas Valley—just 10 to 20 minutes from downtown Park City--is home to some of Utah’s most exclusive large acreage ranches. 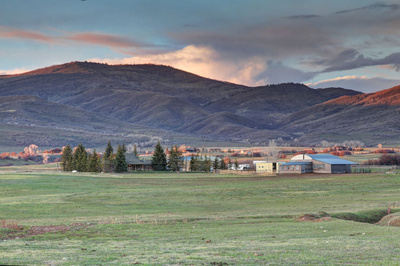 Sandwiched between the Wasatch Mountains to the west, and the Uinta Mountains to the east, it’s hard to imagine a more scenic location for a ranch than the Kamas Valley. The Kamas Valley stretches from Rockport Reservoir (known for its excellent fishing and boating) in the north, to the majestic properties in Wolf Creek Ranch to the south. Leaving Park City and crossing under US 40, it’s an easy drive through scenic Brown’s Canyon to the town of Peoa. When you cross the bridge over the Weber River and look up at rugged Utah red rocks, you’ll breathe a sigh of relief that you’ve left the resort hustle and bustle of Park City behind. It’s the best of both worlds, really. You feel like you have escaped to a different world, but it’s so convenient to everything you love about Park City. You’re only 10 minutes to the Park City Hospital, and 12 minutes from Park City High School. Skiing, shopping, and over a hundred restaurants are only 15 minutes away. Just a couple of minutes up the road from Peoa is the authentic western town of Oakley. When was the last time you pulled up at a full-service gas station, the bell rang, and a friendly attendant filled your tank and washed your windows? Welcome to Oakley...where you can’t help but feel like you stepped out of a time machine. The two restaurants in town lend themselves to the quaint feeling—the Road Island Diner is Utah’s only restaurant on the U.S. National Register of Historic Places. Lovingly restored in 2007, what you see now is the same type of bygone craftsmanship that you would have seen in 1939 as this depression era pre-war diner was wheeled out of the factory. Oakley is real. And it’s quiet. In fact, it’s real quiet... So it’s no surprise that fast-lane stars cherish the area as their secret retreat from chaotic city living. Emmy winning (2007 for her role in Grey’s Anatomy) actress Katherine Heigl and her husband, country musician Josh Kelley, reside on a ranch in Oakley, Utah not far from the mouth of Weber Canyon. Singer/songwriter Graham Russell of the legendary ‘80’s rock band Air Supply resides on a 1000+ acre ranch at the other end of the Kamas Valley in Woodland. 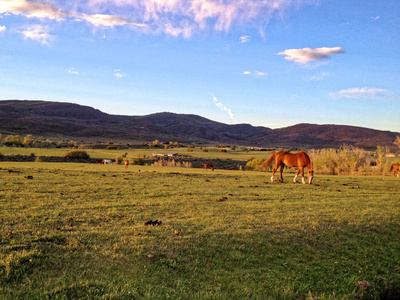 Ranch living in the Kamas, Utah area is the polar opposite of city living. It’s the epitome of country living, in fact. While Oakley remains undiscovered by many, it’s well known by equestrian enthusiasts. The biggest event of the year in Oakley is July 4th weekend, when the town of Oakley hosts the renowned Oakley Rodeo. This year will mark the 85th anniversary of this officially sanctioned event by the Professional Rodeo Cowboys Association. Contestants earn dollars and points towards qualification for the national rodeo finals in Las Vegas. But rodeo is only one part of the thriving equine scene in the Peoa & Oakley areas. The town of Oakley has public indoor and outdoor arenas. Neighbors breed, raise, and train horses. If you are looking to improve your riding, local experts—including the adjacent neighbor—offer clinics in dressage & sport horse riding disciplines. Best of all, you’re conveniently located near dozens of back-country trail-heads, where you can explore on horseback to your heart’s content in the nearby National Forest that’s right out your back door. Oakley & Kamas are the gateway towns to the Uintah Mountains, and the 2.17 million acres Uinta-Wasatch-Cache national Forest. The scenic beauty of this forest provides unlimited recreational opportunities throughout the year. Whether you enjoy hiking, snowmobiling, back-country skiing, camping, picnicking, fishing, boating, backpacking, hunting, scenic driving, biking, riding motorcycles & ATV’s, swimming, or horseback riding, you’ll be able to indulge your wilderness fantasies here. If ever there was a mountain paradise bordered on all sides by incomparable natural beauty, Peoa & Oakley are those places. It is a throwback to the way Park City & Deer Valley used to be: rural, quiet, private, relaxed, and unpretentious. Of all the ranches on the Park City outskirts, perhaps the crown jewel is Eagle Watch Ranch, midway between these two sleepy Utah towns of Peoa & Oakley. It’s the big ranch up on the plateau that’s nearly invisible from the road, thanks to the gracefully winding driveway that you climb to reach the ranch gates. Don’t let the discrete entrance fool you. Once you ascend the small hill, you’re treated to epic 360 degree views looking across the valley at distant mountains in all directions. The property--once listed for $8 Million--was just reduced to under $3.5M last week. 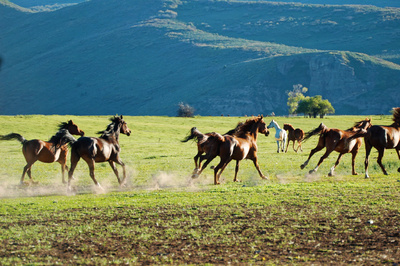 And few—if any—Kamas Valley ranches can match its unique combination of attractions. The ranch sits atop a mesa that’s all but invisible from the road. Unlike most of the “lowland” ranch properties along the river that are prone to flooding and are seasonal wetlands, this ranch sits high and dry atop a majestic plateau. Let it rain, and let it snow. You’ll be safely perched above the seasonal runoff collection areas while you gaze out at gorgeous mountains in all directions. 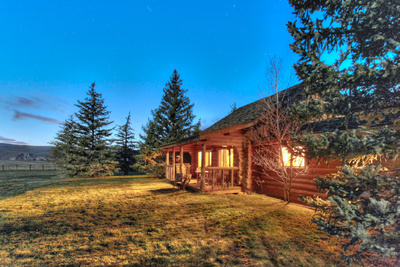 The elevated setting makes Eagle Watch Ranch feel like one of the most sheltered, exclusive, and most beautiful ranch properties in the Rocky Mountain region. Unobstructed sunrise views looking across the valley towards millions of acres of National Forest beyond. You hardly see your neighbors at all! The fencing that welcomes you to the ranch as you come up the driveway is a 3 rail Kentucky style fence that also bounds pastures surrounding the existing ranch home. The perimeter of the ranch is secured by wire fencing that’s suitable not only for horses, but for cattle as well. Some future owners might like to build their dream home somewhere on the ranch, and the sky is your only limit if you’re inclined to embark upon this journey. 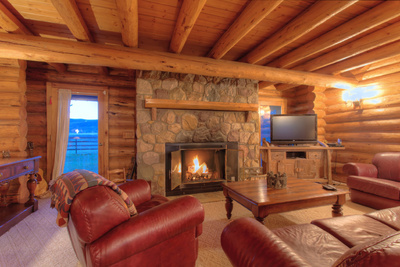 Others will delight in the simplicity of the existing ranch cabin, which sits on a 75 acre parcel. The ranch home is incredibly authentic to the surroundings. Think Sundance Catalog interiors—clean and rustic, with functional spaces and windows in every room that look out over the ranch. When you step inside from the generous covered porches, you’ll discover a floor plan that delivers every amenity you need in a ranch home. The focal point of the home is the great room fireplace. A cozy loft upstairs is open to the lower level. The unfinished lower level below would make a great home theatre, game room, wine cellar, or some combination thereof. With plenty of windows, and perfect southern exposure, the rooms are bathed in the golden light for which the mountains and especially the Kamas Valley are renowned. The home is currently undergoing significant renovations. When these renovations are complete, this ranch will include new wood flooring throughout, new baths, upgraded kitchen, and a freshly stained exterior. The unobstructed panoramic mountain views from every room are nothing short of breath-taking and must be seen to be appreciated. From now on, you can live, sleep, and work, and whenever your heart desires, look upon the vast eternally impressive natural ranch setting. Possibility for pasture boarding of other horses. Over 100 acres of hayfields. On the existing ranch, it’s very easy to ride for a couple of hours to take in the stunning view perspectives from different corners of the ranch. Many owners will want to keep the ranch as one large parcel—a beautiful and private equestrian estate. However, the ranch is actually comprised of separate parcels, and the current owners may be willing to sell individual parcels if you don’t require the full acreage to satisfy your own personal dream of owning a horse ranch in Utah. The current owners have had preliminary discussions with the Summit County Planning Commission about the possibilities the ranch may hold for future development. As it currently is configured, the ranch includes 8 lots of record. There are 11.1 acres of Highway corridor zoning, which increases the potential development density. The other 179.79 acres are in the Agricultural protection zone. For tax purposes, the bulk of the ranch is in “Greenbelt” status, which keeps the annual property taxes surprisingly low. Summit County offers a flexible development code, with incentives for creation of open space within new subdivisions. You have the ability to work within the existing zoning, or possibly even create a Specially Planned Area (SPA) to give you even more flexibility about how you might be able to maximize the value of the land. 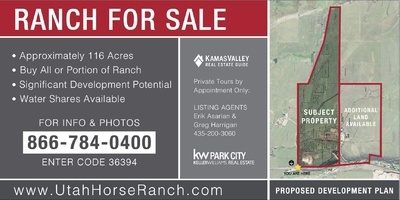 The current owners, along with veteran Park City land planner Eric Langavort, have created a sensitive and sensible conceptual plan for a 17 lot mini-ranch subdivision that retains the rural character of the ranch, yet adds value to the property for future owners who may be inclined to develop. Savvy investors in western states know the value of water—it’s sometimes worth more than the Utah ranch land itself. The current owners of the ranch are among the largest shareholders in the local water companies—approximately 131 water shares in assorted irrigation companies. The water is distributed through the ranch via a network of ditches. The Buffalo Run Ranch sold at auction for approximately $10M to a member of the Sorensen family—Utah’s largest private landowners. 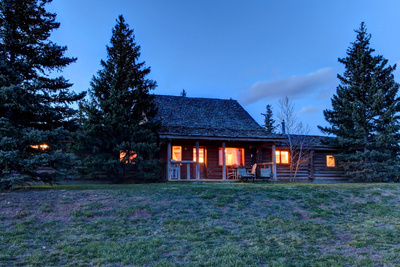 Nearby, the “Freestone River Ranch” which is currently listed for $9M was acquired and restored by a private equity fund that invests exclusively in blue-ribbon private fishing ranches around the Rocky Mountain West. The “Big Piney” Mountain Ranch is comprised of over 7,400 acres, and is offered for sale for $16.4 Million on the nearby west slope of the Uinta Mountains. Savvy buyers who can afford to own a ranch anywhere have indeed discovered this picturesque little valley at the foot of Utah’s Wasatch Mountains. Owning a sanctuary ranch near Park City, Utah will allow you to share your success with those you love, and make a knockout impression on business colleagues. This Utah ranch for sale has strong bones, with thick logs, expansive woods, solid doors, high-end fixtures and quality craftsmanship throughout. It was designed top to bottom to entertain in generous style. To your guests, this property says success in so many ways. Seated like a monarch atop a private plateau, this sprawling ranch has everything you could want for family entertainment. Your property is a spacious 187+/- acres acres, and it seems ever so much bigger. Perhaps because that’s because some of your adjacent neighbors are landlocked, and may never be able to develop their properties. No matter which way you turn, you face the mountains and your “front yard” feels like thousands of acres—unobstructed as far as your eye can see. Your nearest neighbor is almost a half mile away and that's your only neighbor. That is such a treat because you’ll never know how these mountains will surprise you on any given day. Some winter storms carpet your world with the lightest, driest snow imaginable. It’s so extremely dry that kids won’t even be able to make it stick together for a snowball fight. Other times, you’ll be amazed at the palate of striking fall colors the oaks and aspens display, from reds to yellows, to gold, against a backdrop of the clearest blue sky you’ve ever experienced. On other mornings, as you sip coffee on your front porch and greet the rising sun over the mountains, you’ll watch a hawk or eagle hovering, prowling for breakfast. On a sultry August night, no man-made fireworks show can hold a roman candle to the sight of a summer lightning storm in the distance. It is so spectacular, you will never forget it. Yet for all its quiet grandeur, this is a cozy, comfortable, lovable getaway that’s just the perfect distance from town. You’ll use it all winter to make memories you and your family will cherish for life. Off-season, you’ll steal away from the hurly-burly for long weekends, when there’s little traffic. You won’t have to make small talk with anyone and you’ll be able to regain your priceless inner serenity by sharing quiet time with just the wind, sky, and peaks. Then this is a ranch you must see before you make a decision to purchase any other. This equestrian ranch will not stay on the market forever. 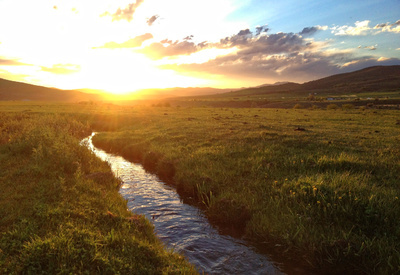 With large private ranches near Park City so limited (especially with abundant water shares and significant development potential) and most of them already fully priced, some smart value hunter is bound to pounce, acquiring a trophy ranch that is both a prize investment and the personal reward of a lifetime.